From Steamhammer's immense vaults comes 2000's 'Calling The Wild', the first of two offerings by German stalwart Doro to receive the deluxe reissue treatment in 2010. Doro Pesch started out as Warlock's frontwoman, her solo profile spanning two decades. Catchy tune ‘Kiss Me Like A Cobra’ sports an AC/DC type beat; lyrics like "Kiss me like a cobra" might be corny, but the track's chorus is hook-laden nonetheless. The moments which precede the chorus boast hints of industrial synth, sprinklings that are almost Nine Inch Nails-lite. Throughout, Jürgen Engler bluesy wail emerges. Revving its engine, ‘Dedication (I Give My Blood)’'s guitar beat subsequently drives along at a hardened pace. Trans-Siberian Orchestra guitarist Al Pitrelli is allowed to show his worth as a guest soloist on the song, particularly re-emerging during the last minute. Crowd vocals from a posse of (Dusseldorf's American football team) Rhinefires players are interspersed throughout "Burn It Up". Despite serving its purpose by producing a solid album track, this predictable football type chant seems like a cheap way of encouraging audience involvement at concerts. Unfortunately, the initial promise these three opening tunes supply isn't kept. Contrasting against its predecessor tracks, ‘Give Me A Reason’ is a slow, late eighties / early nineties type power ballad, ‘Scarred’ and ‘Who You Love’ adhering to this. ‘Who You Love’'s quietened music casts the spotlight upon Pesch's vocals, its choruses the exception. Pitrelli guests here too, but his role is sadly lessened. Reeled off the tongue, ‘Ich Will Alles' sprints along, suggesting 'Calling the Wild' might just improve its fortunes. Aided by distorted guitars, a piano retains the distinctive beat of Billy Idol's ‘White Wedding’. ‘White Wedding’ is an uninspired choice of cover nowadays, though in Pesch' defence, this cover emerged a decade ago. A la the shock rocker's ‘I Wanna Disappear’, a Marilyn Manson type vamp dominates ‘I Wanna Live’. Cover specialist Bob Kulick excessively solos on Doro's rendition of Motörhead's ‘Love Me Forever’, meant to be a duet with Motörhead mainman Lemmy - unfortunately, he's barely audible. Pesch's voice doesn't suit, especially since Lemmy's whiskey-soaked vocals heavily contributed to the original's success. An acoustic ballad mostly stripped, ‘Constant Danger’ verifies that Pesch's vocals don't require a glossy production. Ex-Guns 'N' Roses axe-slinger Slash surfaces on ‘Now Or Never’, where his trademark rock n' roll swagger is unmistakable. 'Calling the Wild''s bonus disc opens with the duet ‘Alone Again’, where Lemmy's leathery tones are more audible, his acoustic guitar solo serving as a staunch interlude as well. The rest are B-side filler, though the decision to include no less than five remixes of ‘Burn It Up’ should come in for special criticism. Live acoustic renditions of ‘Ich Will Alles’ and ‘Burn It Up’ prove surprisingly entertaining, however. By no means a classic album, 'Calling The Wild' nonetheless boasts two stellar compositions in ‘Kiss Me Like A Cobra’ and ‘Dedication (I Give My Blood)’, with ‘Burn It Up’ following close on their heels. Maybe Steamhammer would consider a Doro ‘Best Of’ set? 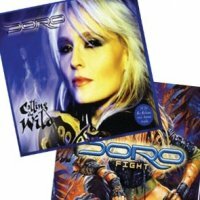 2002 Doro (Pesch) full-length 'Fight' marks the second of the German songstress' albums to undergo deluxe reissue treatment by Steamhammer in 2010. Adopted as the walk-on anthem for thirteen time world champion boxer Regina Halmich, title cut ‘Fight’ almost marches to war. Pesch quietly hums its verses in an inconsequential manner, the hum heightening to more conventional tones as the verse wears on. Pesch's vocals are seemingly less produced here than on 'Calling The Wild', which works in the album's favour. Sophomore composition ‘Always Live to Win’ carries a rock 'n' roll vibe, its punk influence suggesting Pesch could've been a credible punk queen had she burst onto the music scene in 1976-77. However, the audience applause which arrives at 2:10 is quite irksome. Resurrecting that rock 'n' roll / punk demeanour, ‘Chained’ is a track that wouldn't be misplaced on early eighties product by Judas Priest and Saxon. Alternative metal oriented, ‘Descent’ is a duet with Type O Negative's Peter Steele, Steele voicing his words in a low, sinister murmur during the verses. The number has a mid-paced sub-industrial vibe, and the guest guitar work from Savatage's Chris Caffery is epically melodic, suiting the track. Caffery applies his magic to ‘Salvaje’ too, Pesch's ode to the time she spent with Motörhead mainman Lemmy in Los Angeles. Why she opted to pen Spanish lyrics for its chorus is baffling, however. On ‘Undying’, its piano flutters slightly and is mostly unaccompanied. A slow love composition, it's stronger than some of her other attempts at cutting a weighty ballad. Penned by Kiss bassist Gene Simmons, the acoustically strummed ‘Legends Never Die’ has blues guitar meanderings throughout - a solely acoustic version of this tune would've been interesting. Audience noise - irksome as ever - inaugurates ‘Rock Before We Bleed’, its underlying riff resemblant to the opening riff present within The Kinks' ‘Waterloo Sunset’. Even though the track's chorus is moderately anthemic, lyrics like “We will rock to be free” are particularly mundane. Piano takes centre stage yet again on ‘Wild Heart’, juxtaposing itself against heavier choruses. Russ Ballard (whose songs have been covered by Kiss and Rainbow) co-wrote, though sadly this isn't one of his finer moments. Bonus content arrives in the form of the somewhat pleasant acoustic ‘Song For Me’, succeeded by a wholly English version of ‘Salvaje’ - why this version wasn't given album status is anyone's guess. An interpretation of ‘Always Live To Win’ complete with a French chorus, meanwhile, will please French Doro fans. A fiery, passionate live acoustic rendition of ‘Always To Live’ precedes a live acoustic rendition of Judas Priest classic ‘Breaking The Law’, which seems a bizarre choice of acoustic cover in theory. In practice however, this rendition is oddly arresting. Like 'Calling the Wild', 'Fight' isn't a classic album either, but all isn't lost; ‘Fight’, ‘Always Live to Win’, and especially ‘Descent’ are splendid highlights, adding further weight to the idea of a Doro ‘Best Of’ set.